Close to a month ago Melissa and I drove around our town in search of some cool walls. It sounds so funny saying that out loud to friends, but that's exactly what we did. We both had completed garments to photograph and wanted fresh new backgrounds for our photos. 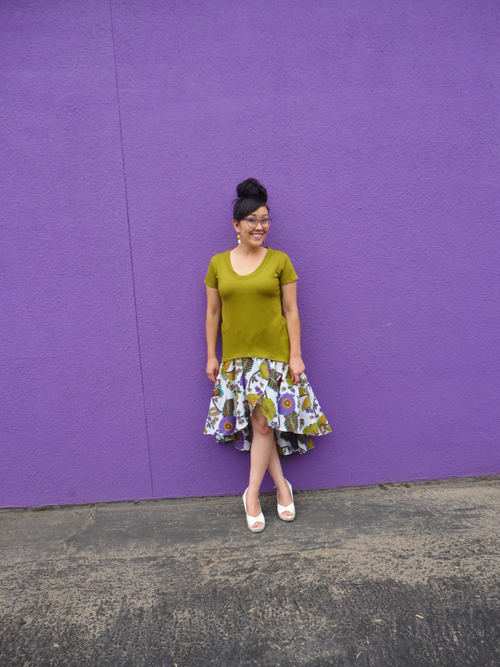 I spotted this crazy purple wall at a local laundromat and it works perfectly with my skirt. First let's talk about the top, the Briar pattern. 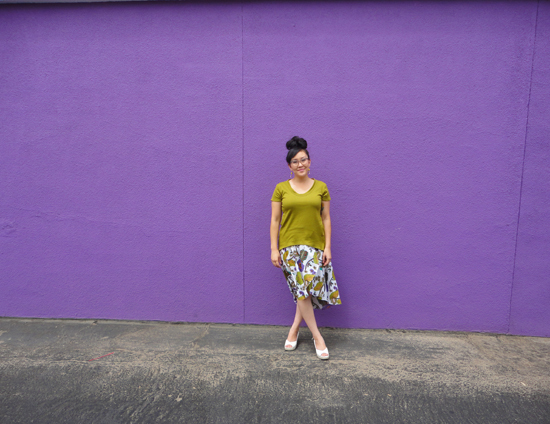 There are a few different options for sewing (long sleeve, short sleeve, cropped, full length, pocket, different neckband finishes), but for every version I've made a short sleeve full length top. And I've made four because I'm addicted. This is such a quick sew and perfect for those of you that want to venture into sewing with knits. I'm one of those people that is really slow when it comes to sewing and I can cut, sew, and finish this top in under two hours. 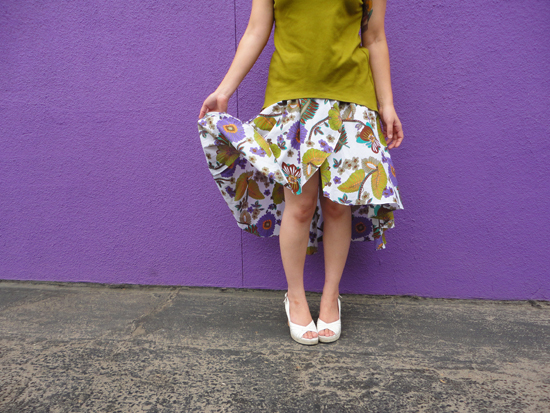 Th skirt is the Cascade pattern, also by Megan Nielsen. This is another beginner friendly pattern and I learned a new skill while sewing it. Well, I used my narrow hem foot for the first time to finish the edges of the skirt... and it didn't work out so well. The fabric kept unrolling out of the foot and it was super annoying. Does anyone have a magical technique they use to get the perfect narrow hem? 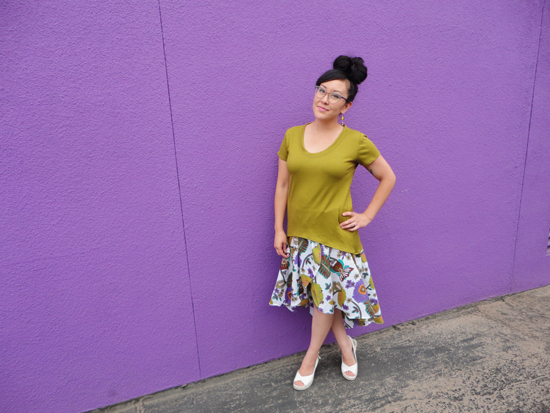 Both fabrics are from Mood, both items are mullet hems, and all photos were taken by Melissa. So. In this post we have a mullet top and a mullet skirt, so I thought I would share a photo of me from nine years ago when I had a fashion mullet. You can go ahead and laugh with me! It has officially replaced the Renfrew, so that's saying a lot! Love the post title! I can't say that I've ever driven around looking for a wall, though I'll confess to wandering around my house looking for a wall with a minimum of kid toys and whatnot that would be in the picture, does that count? I have struggled with the rolled hem foot myself, though I suppose if I'd ever just sit down and practice with it I'd get better. If you have a serger though, they can do a cool rolled hem that is much easier. That's my magic cheater's trick, but I'll admit that it doesn't look right for every application. What a great wall! 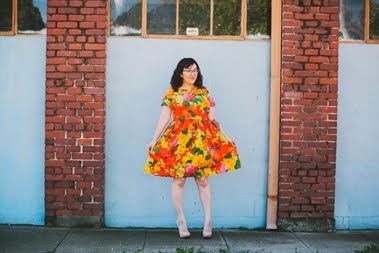 I haven't tried any Megan Neilson patterns, but they are mighty tempting! I really want to sew the cascade skirt!!! Your color combos are really fun! And, the wall is PERFECT scenery for your photo shoot. :-D I sewed a mullet shirt too recently, At least, that's what I consider it. Because, it's all party in the back. Gillian, I think you would really love them! The colours in the top and skirt match so well! Pretty! And omg I'm so jealous of your wall haha :p my cruddy backyard will have to do for now lol! That really was a cool wall! It was perfect with those colors. Thanks for driving around with me! My teacher at Cuesta showed us an easy way to do a narrow hem: First you fold over and press like 1/2 inch or wider, then sew about 1/4 inch from that edge. Then you trim off the excess right at the stiching. Then fold it under again. It's really easy to fold over and stitch a narrow hem at that point. If that doesn't make sense I'll show you one day! I'm glad I'm not the only one who cruises around looking for walls : ) Beautiful outfit and LOVE the mullet-hair photo! This color looks so cute on you! You've reminded me that I need to make another Briar top! I love your face in your hair mullet shot...you seem not entirely convinced of the cut! Can't wait til I have my waist back cause I've been eyeballing that skirt since it came out. Yours is so pretty, love that fabric! This is such a fierce colour combo on you, Erin! And may I say that is a priceless photo- go the awesome teen hair! I'm probably thinking, "this haircut is a mistake!" Yes, you need the skirt pattern! I can totally see you wearing it! I think I'm making another one tonight. Obsessed. You will love the pattern! Drive around your town and look for walls! Suddenly you will notice things you never noticed before! Yes, I need to refer to that tutorial! Thank you! You should get the Cascade pattern! It's really straightforward if you don't mess up your hem like I did. But that's a total user error and nothing to do with the pattern! I'm going to try that next time! Thanks, Melissa! Love the outfit! You look so different without glasses! love love your oufit, but i am in love with those white shoes!! are they a wedge? ?